WASHINGTON – Since the realization of the first laser cavity countless questions have been asked for which laser light has provided the answer. Numerous questions have also been posed in an effort to improve on our abilities to produce lasers with various performance specifications and wavelengths. A question that was not asked until recently is – what happens if you shine a laser beam through another laser cavity? It may not seem a practical question to ask experimentally, but after studying how externally incident light interacts with an active laser cavity in quantitative detail, the answer turns out to offer devices with new, seemingly paradoxical optical capabilities. Now, an even closer look at these capabilities has provided a unique window into fundamental physics and optical behaviors. 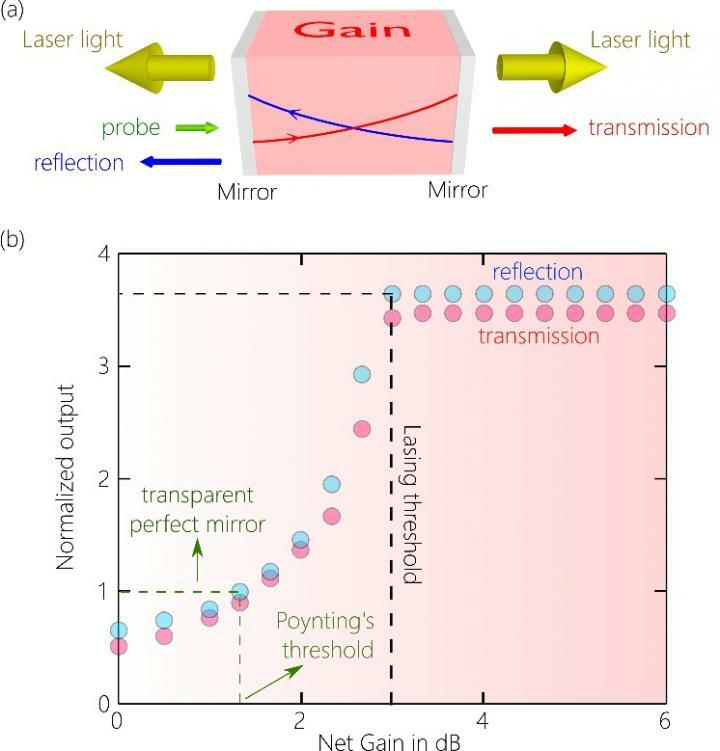 The collaboration researching these laser cavity interactions, from the University of Central Florida's College of Optics and Photonics (CREOL) and Yale University, developed a perfectly reflecting one-way mirror, offering truly concealed observation windows; something passive materials can only approximate. Probing deeper into the mechanism of this paradoxical behavior, they have also now revealed fundamental aspects of what governs the optical responses and a direct view of causality's role. Ayman Abouraddy, University of Central Florida's CREOL – Multi-Material Optical Fiber Devices group, will present their group's findings at Frontiers in Optics + Laser Science APS/DLS (FIO + LS), held 17-21 September 2017 in Washington, DC. "A cavity is one of the fundamental components we have in optics – it's basically two mirrors in front of each other," Abouraddy said. "We've been looking at what would happen if I send a beam of light through such a cavity with gain inside as I gradually crank up the amount of gain. We're studying what happens to light that is sent through a cavity if the cavity is active." By changing the amount of gain, the cavity's optical response to a separate incident laser (of a different wavelength) also changes. This active component measurably changes the reflection and transmission, depending the active gain level of the cavity. "As we increase the amount of gain, the cavity will lase on its own. For our research today, we are more interested in what happens to a signal that I am sending through that cavity," Abouraddy said. When the cavity does begin to lase, however, a fascinating and important shift in the behavior appears. At that point, both reflection and transmission amplification top out, although the power of the probing signal remains linearly related to the output. This also demonstrates the effect is not near saturation. "The cavity is not allowed to amplify beyond a certain limit after you hit lasing," said Abouraddy. This effect, known as gain clamping, is part-and-parcel to stable functioning of the laser. The similar response to externally incident light, however, which lends to a truly transparent perfect mirror, is not only novel but offers new insight into fundamental physics. The team's experimental demonstration used a fiber optic cavity in which they separated the forward and backwards travelling light. When they closely investigated the dynamics of directional energy flow in the cavity as that gain was increased, what they found related to fundamental physical principles. Abouraddy explains that at sufficient gain, as light makes trips in the cavity in both directions, a null in the energy flow where the two directions cancel gradually creeps deeper into the cavity. The behavior of this null links a laser's fundamental threshold to a direct demonstration of causality's limits. "At the lasing threshold, that null reaches midway in the cavity. It turns out increasing the gain further, that null refuses to move ahead, and it's pinned to the middle of the cavity," he said. "That is why when we increase the gain, we don't see further amplification. Now the beauty of this whole thing is it turns out that it is connected to causality. If that null were to move further beyond the midway of the cavity, which would be a violation of causality. In this case, one would get an output from it before you sent an input." The presentation entitled "Gain-Clamping for an Externally-Incident Field Passing through a Laser Cavity," by Ali Kazemi Jahromi, will take place from on Tuesday, 19 September at the Washington Hilton, Washington DC, USA. A media room for credentialed media and analysts will be located on-site. Media interested in attending the event should register on the FiO + LS website: Media Center. Frontiers in Optics is The Optical Society's (OSA) Annual Meeting and held together with Laser Science, a meeting sponsored by the American Physical Society's Division of Laser Science (DLS). The two meetings unite the OSA and APS communities for five days of quality, cutting-edge presentations, in-demand invited speakers and a variety of special events spanning a broad range of topics in optics and photonics–the science of light–across the disciplines of physics, biology and chemistry. The exhibit floor will feature leading optics companies, technology products and programs. More information at: FrontiersinOptics.org.